Wool rugs are very popular as stylish accessories in the home, and cleaning is a practical consideration when deciding on a rug for your home. You want to make sure the rug you choose fits your lifestyle, so that you can realistically maintain it as needed. It will be well worth the effort, care, and attention to have a clean, beautiful rug displayed in your home. Natural wool rug cleaning and maintenance is usually relatively simple to accomplish as wool is naturally stain resistant, but may need professional cleaning every once in a while to get dust and grime out. However, wool Oriental rugs, with their rich colors, may require more testing for color bleeds before professional rug cleaners attempt to clean them. When a thorough clean is necessary, both wool Oriental and natural wool contemporary area rugs benefit from knowledgeable, professional and experienced area rug cleaners. Natural wool rugs, such as those made from 100% New Zealand wool fibers, are often more subtle than Persian and Oriental rugs. The colors of natural wool area rugs are subdued, muted and neutral, not bright, vibrant and bold, as those of Oriental area rugs. Often, these area rugs are available in only one color. The patterns, if any, are very simple and straightforward, not intricate and elaborate. Natural wool area rugs are all about simplicity: simplicity of design, color, and style. They are, however, very practical and are usually easy to take care of, since wool area rugs are naturally stain resistant. Natural wool area rugs have unique cleaning requirements that should be evaluated by professional area rug cleaners for optimal results. When wool area rug cleaning is attempted at home, results cannot be guaranteed. In fact, natural wool area rugs are often damaged in the process. 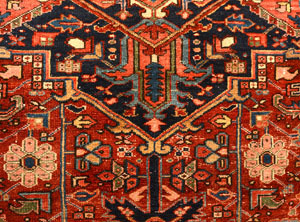 Damage done to the rug may be irreversible and such experiments may ruin a beautiful and expensive wool rugs. Wool rugs should be professionally cleaned every 12-18 months or when a spill or stain occurs. Dalworth Rug Cleaning uses a 10-step rug cleaning process to prevent color bleeds and to clean your rugs to your satisfaction. Give us a call to have Dalworth Rug Cleaning take care of all or your rug cleaning, repair and restoration needs. We will pick your rug up, clean it and return it to you within 4-7 business days. Contact us today, and we will take care of the rest!